This is it. 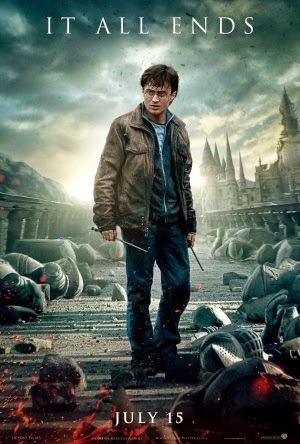 Harry Potter and the Deathly Hallows may have originally been a novel that ended the Harry Potter saga back in 2007, but the decade long life of the film adaptations now draws to a close as we finally witness the conclusion to this global phenomenon on the big screen. Whilst Part 1 did a good job setting the stage and building up the tension, the abrupt ending left many underwhelmed. If you were one of these people; fear not. Not only will Part 2 satisfy your taste for the true finale, but it's safe to say it's easily the greatest Potter film ever produced. This film easily has the darkest vibe of the entire series; including it's predecessor. The serious tone is set through some incredibly rich performances and some of the gloomiest sets and special effects the series has seen, which should be evident if you've seen the trailers and stills. The soundtrack (composed excellently by Alexandre Desplat) also possesses a much more gloomy tone than ever before; we still have those iconic themes at certain points, but there's a lot of desolate pieces that really help to move the emotional scenes (yeah, I almost cried again). Unlike Part 1, Part 2 is available to watch in 3D format, which doesn't truly warrant the extra cost as there's no real enhancements made by the extra depth, so save your money and choose 2D. The plot is inevitably going to feel rather disjointed to those who have not seen Part 1, as nothing from that movie is revisited and instead we are put straight into the ensuing events. But in fairness, there's no reason to see this movie if you have not seen Part 1, and in all honesty any of the previous films. You'll really have to witness the build up to the epic finale to appreciate the characters and their motives, and to get a solid grasp on the incredibly deep plot that has been unraveled over time, which this film does a fantastic job of drawing to a satisfying closure. We witness the shocking revelations of many secrets and motivations that have been hidden from us over time; all shown through a variety of clever film techniques. And not to mention the incredible final battle in Hogwarts which is truly stunning. All these events culminate nicely to form a truly satisfying conclusion, and only remind us of how this magnificent tale touched our hearts. The main trio (Daniel Radcliffe, Rupert Grint, Emma Watson) are at their finest here, and I mean that sincerely. We all know they were pretty lackluster in the early films (I know, they were just kids), but here we witness the amount of talent and experience they have built up over the course of the last films translate into what is easily their best performances yet. Ralph Fiennes also captures the menacing and somewhat paranoid nature of Voldemort excellently, just as he did in the past few films, making for a truly memorable villain. The supporting characters are also well played; especially Neville Longbottom (Matthew Lewis), who is a lot more prominent than he has been in the past films, and after you see how awesome he really is, you'll be glad. To wrap things up, all I can say is that this magnificent series of films draws to a brilliant closure with Harry Potter and the Deathly Hallows Part 2. Part 1 was definitely a solid build up and an enjoyable film in it's own right, but Part 2 takes all the tension conjured by it (and the other six films) and creates an explosive and truly gripping finale. It has some moments that could've been polished, and some explanations could've been handled better, but it is sure to satisfy all fans of the franchise. The books and films may now be finished; but Hogwarts will forever live on in our hearts.